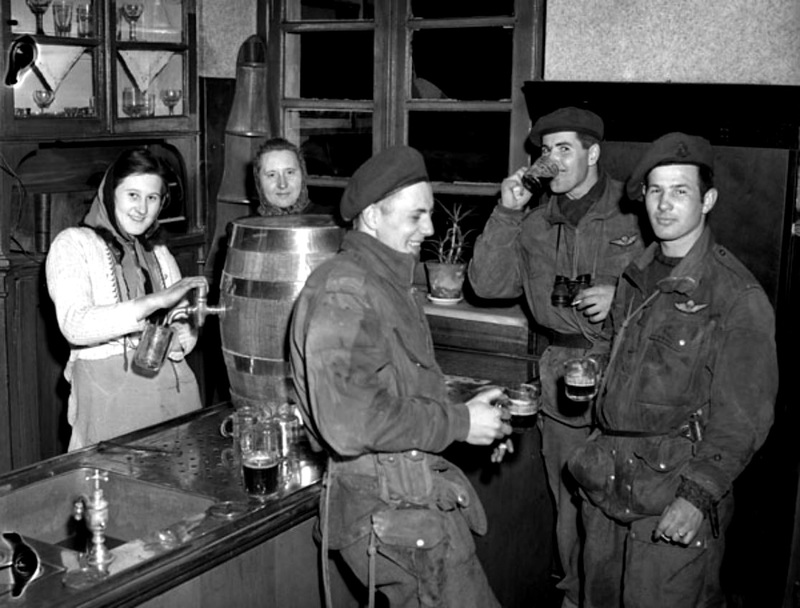 Soldiers of the 1st Canadian Parachute Battalion have free beer at a tavern, served by German women. Lembeck, North Rhine-Westphalia, Germany. 29 March 1945. As many of you know, this Friday is Veteran’s Day, and we want to take this opportunity to say thank you to those who have served our country. To our grandfathers, grandmothers, fathers, mothers, brothers, sisters, uncles, aunts, sons, daughters, and friends who have served in the military, we want to say thank you. You have risked it all, and we appreciate it. This Friday, any veteran, reservist or active duty military personnel who visits the Burning Brothers taproom, you first pint is on us. You’ve earned it. The current American military has some strict policies surrounding drinking, has it always been that way? The history of the American military and drinking (specifically drinking beer, because, Beer!) is a long and colorful one. When our founding fathers were planning the revolution, taverns were popular meeting spots. One of their favorites was The Green Dragon, a tavern in Boston frequented by Sam Adams. The Continental Congress enacted an early statute, in November of 1775, that stated that each soldier within the army should be provided with 1 quart of beer or cider per man, per day. (that’s a lot of beer!) One of General George Washington’s lesser known skills was his ability to make sure that his armies were camped within reasonable distance of a supply of beer. During World War II, the US Department of Agriculture actually ordered that 15% of all beer production be set aside for the troops, which was actually more than the regular citizenry was receiving. On top of that, this canned beer was much stronger than what was available in Britain, and was often painted drab green to improve it’s camouflage from enemy aircraft. The Vietnam War was a time when beer was freely available to troops, and many different brands of American beer were shipped overseas for our soldiers, as it was preferred to the Vietnamese-made lager. Soldiers drinking right up until going out on patrol or piloting a helicopter was not uncommon. In today’s military, most branches restrict drinking to off-duty times, and military personnel are expected to never be on duty with a blood alcohol level over .05. In fact, the Marines expect it to be under .01 anytime you are considered active. Meanwhile, the Navy’s fleet operates “dry” while on deployment, with the exception being an allowance of 2 beers per person at the end of every 45 contiguous days at sea. Tap selection for the weekend includes Pyro American Pale Ale, Roasted Coffee Ale, Fused Orange Blossom Honey Ale, Cranberry Shandy, Raj-Agni India Pale Ale, abd Grapefruit IPA. This weekend our food trucks are Wholesoul on Friday (11/11), with their unique take on Soul food, and Signature on Wheels on Saturday (11/12) with their eclectic American fare. Our cupcake this weekend is Ginger Cardamon Apple, which is a ginger cake with apple filling and cardamon cream cheese frosting. As always, all food served at the taproom is gluten-free! We wanted to give everyone a heads up that St. Paul has changed their ordinance regarding off-sale closing times. Starting the week of November 21st, all St. Paul breweries are able to sell beer to go (i.e., growlers) until 10pm every night they are open (and liquor stores too). In addition, we’ve had enough people stopping by earlier in the week that we have decide to add an extra taproom night. That being said, we will be closed on Thanksgiving to allow our people to spend time with their family and friends. Newsletter: Burning Brothers, a Bodega of Bearded Beerness?